I wouldn’t be surprised if you have been wondering as you have read these blogs, how much my mother supported my father; the man who spent their entire wedding night on the phone to the UK trying to get a job interview with Colin Chapman? Then, barely a month later, he whisked her off to the other side of the world with no job prospects or money to speak of. Well if the beginning of the story didn’t give you some idea, I’m pretty sure the following will. And by the time my father moved back to Lotus in 1991, we were extremely fortunate to meet quite a few others who would give their complete commitment and support. My father and Peter Wright, both motivated by having worked closely with the Chapman and inspired by his engineering genius, and determination, felt driven to negotiate to take over Team Lotus to repay the ‘Old Man’. They just felt they couldn’t let it go without a fight. My father was going back and forth from Oxford to Norfolk in the latter half of 1990 meeting with Tony Rudd on behalf of the Chapman family. 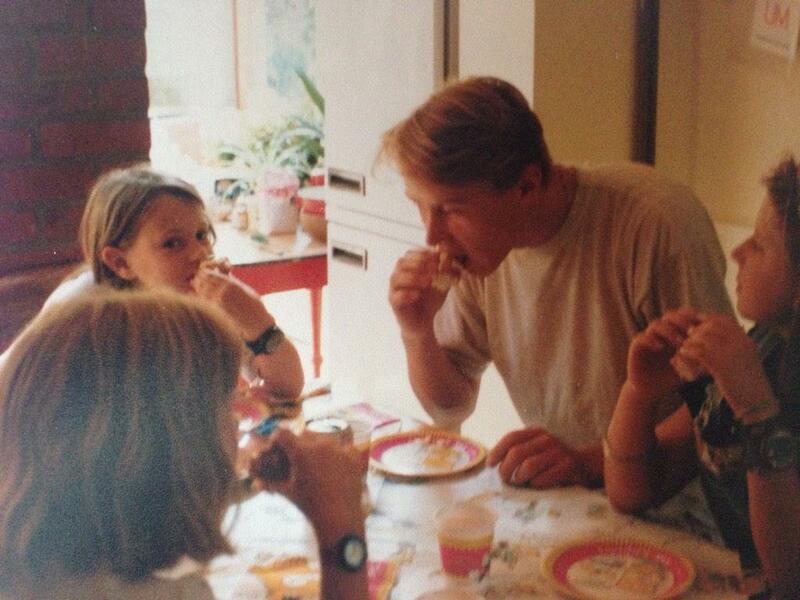 After signing the contracts to complete the sale at the end of that year, he moved to Norfolk at the start of 1991, while my mother and I stayed in Oxford so I could finish my school year. I remember missing him very much and my mother finding it hard on her own with him being away most of the time. Not only was he not there during the week but, of course he was still travelling to races, meaning we only saw him every other weekend. 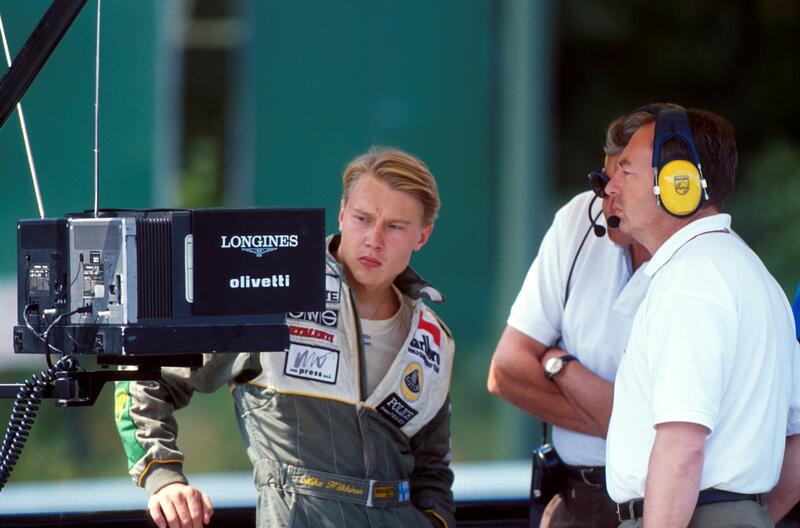 In August 1991 my mother and I moved up to Norfolk to join him, however with no house of our own in Norfolk, we moved into the house where my father had been renting a room with other Lotus team members, including driver Mika Häkkinen. An interim measure until we had time to find a house of our own. For me this was great! Being only ten (and an only child) I basically had someone to play with because twenty-two year old Mika and I got on like a house on fire. You know, in a brother sister kind of way. Fighting over the remote, stealing my last piece of birthday cake… you get the idea. He would often pick me up from school dressed in a race jacket over his pajamas (which were technically a onesie with bunny rabbits on them) and be one of the family in the evening. However the “box room” in the four-bedroom house, with seven residents, was not my mother’s idea of fun! My parent’s room was the smallest in the house with barely enough room for a double bed. Mika, Team Manager Greg Field and Team Coordinator Suzanne Radbone each had their own room. And poor Nigel Stepney, Engineering Manager, was on a fold-away bed in the lounge. And everyone thinks Formula One is so glamorous! I had no room at all. I slept in Mika’s room when he wasn’t there, otherwise I’d share with Suze, sleeping on a mattress on her bedroom floor. It was strange when the house was so full most of the time and then completely empty when everyone was away racing. We lived in that house for six months before I think my mother probably put her foot down. When I look back on it now I see the level of commitment there was from everyone involved. People who worked at Team Lotus during that time all believed in what they were working towards, to the point where they put the Team before themselves. 1991 was an incredibly tense year for Team Lotus. My father and Peter Wright took over the Team on 4 December 1990 (recognise that date? ), with no chassis, no engines, no sponsorship, but a workshop and staff. Just three months later they were at the first race of the 1991 season in Phoenix, complete with two cars, two drivers and sponsorship. Mika qualified 13th out of 26 drivers proving the Team was very much alive! The two Peters worked tirelessly to bring Lotus back from the brink. They put everything they had into making the Team work; time, blood, sweat, tears and their own money. An invaluable addition to the existing committed staff was new Factory Manager John Love, who had followed my father from Benetton to Lotus. It was John who produced miracles in getting the cars built against the odds. Although severely limited by budget Team Lotus finished tenth in the 1991 Constructors World Championship, securing the Constructors’ bonus, freight allowance and television revenues, all crucial to their survival. 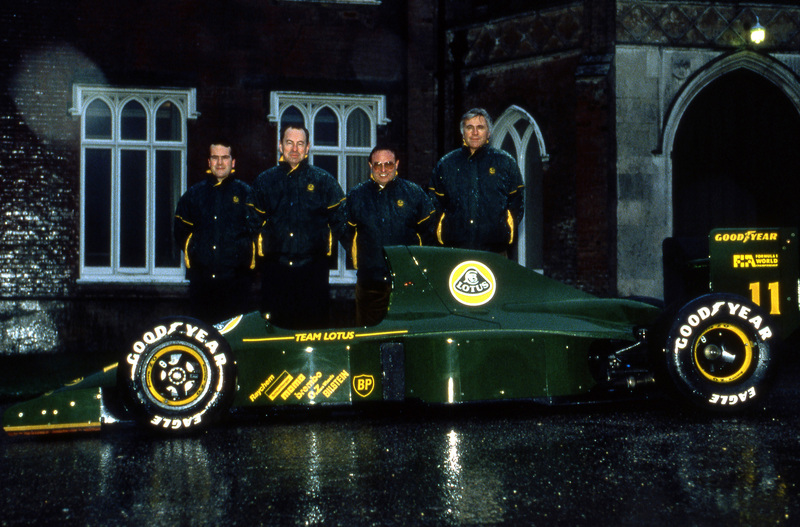 The following year Team Lotus appeared to be on an upward trajectory of success. They were able to secure some very good results to finish fifth in the 1992 Constructors World Championship. Something that was no easy feat considering points were only awarded for the first six places back in the ‘90’s. If you then think that Williams, McLaren, Benetton and Ferrari were on budgets of up to forty million pounds when Lotus were on just eight million, it becomes even more impressive. I don’t think Team Lotus would have made it through the final four years without the patience and support my mother gave my father, the determination of my father and Peter Wright, and the unwavering dedication of the employees who made their own sacrifices to see an iconic team continue in Formula One. Lotus wasn’t just a business it was a true team and a family who embraced the spirit and determination of the Team’s great founder, Colin Chapman, something I believe Chapman would have been proud of. It was Chapman’s leadership and mentality which inspired my father and Peter Wright to take over the Team when it was on it’s knees; Team Lotus was their “raison d’être” and a debt they felt they owed to their teacher and mentor, a truly unique man. “In adversity we thrive” – Colin Chapman (Translation of the Chapman family motto – Crescit Sub Pondere Virtus).